Gefällt mir nach "The Bends" am besten! Da flippen die Kritiker und die hippen Hörer aus. Schwer depressive Töne aus England, unterbrochen vom Rocker "Electioneering". Zauberwelten erschliessen sich mir. Wonderful Radiohead! Zurecht eines der Jahrhundert-Alben. Nacheifernde Bands inbegriffen. Zm Album: Jeder Song entfaltet sich in sich und auf der Ebene des Albums vollständig. Tolle Scheibe. Die Radioköpfe ergreifen mit einem Mix aus Melancholie und Verträumtheit, inklusive zweier netter Rocker. Eine gelungene Scheibe die meinen persönlichen Geschmack aber nicht trifft. Ja, Southpaw, drum hör ich Radiohead nur mit abgespreiztem kleinen Finger. Interessant ist ja, dass das Album stimmungsmäßig ganz unterschiedlich aufgenommen wird. Für mich ist "Ok Computer" größtenteils so traurig, dass es mich meistens mit "runterzieht". Auf jeden Fall ein großartiges Album, das berührt, das einzige was mich an dem Werk stört ist der ganze Rummel der drum gemacht wird. Ihr 3tes Album katapultierte sie hoch hinaus, auf beiden Seiten des Atlantik #1 und wie die Band selbst meinte:"völlig überbewertet!" Hinreißend ist nur "Karma police", mir sind hier viel zu viele klangliche Überraschungen. "For one minute, there, I lost myself"
Das erste richtig schwierige Radiohead-Album, nach dem Grunge-inspirierten lauwarmen Debüt 'Pablo Honey' und dem britpoppigen Meisterwerk 'The Bends'. Einflüsse von den Beatles ('Karma Police'), Kraftwerk ('Fitter Happier') und Chopin ('Exit Music for a Film') werden verarbeitet, Düstere Texte über Verschwörungen oder eine dystopische Zukunft wechseln sich mit persönlichen Zeilen ab, harte Gitarren ('Electioneering') treffen auf nachdenkliche Melodien ('No Surprises') oder beide werden gleich in einen Song gebaut ('Paranoid Android'). Die LP vertritt über die ganze Spielzeit eine düstere Stimmung, die in den folgenden Jahren dutzende zu imitieren versuchten - und alle sind daran kläglich gescheitert. Eine klare 6, das bedeutendste, beeindruckendste, einflussreichste, stärkste Album von Radiohead. Stark. das erste und beste vom band. Nach 3 Stunden einhören ein Meisterwerk für sich im ganz großen Stil. Songs klingen unterschiedlich. Affekt ist bei Exitmusic (For a Film), No Surprises, Karma Police und Paranoid Android einfach genial. Songtexte metaphorisch und sehr tiefgründig. Gut gemacht und ein Klassiker von die 90.Jahren ! 61 Wochen im Backcatalogue Chart ! Das beste Album der Band. Ein "Klassiker", ja. Ohne Zweifel. An diesem Status möchte ich auch nicht rütteln. Aber so gut finde ich das Album eben auch wieder nicht. Das ist alles ganz ansprechende, teilweise ziemlich komplexe und schwer verdauliche Musik, die in gewissen Momenten grosse Wirkung auf mich haben kann, mich in anderen aber auch wieder völlig kalt lässt. Eindeutiges Highlight der Scheibe ist das brillante "Let Down", welches zu meinen allerliebsten Songs von Radiohead gehört. Ansonsten fallen "Electioneering", "No Surprises" und "Karma Police" sehr positiv auf, während der Rest wie gesagt auch nett und schön ist, aber nicht herauszuragen weiss. Meisterwerk. Eins der besten Alben der 90er. A Modern (well still under 20 years old) Classic. Known for being the album that 'killed' Britpop . Even 'Fitter Happier' is essetial to keeping this album amazing. 'Paranoid Android' is absolutely epic, fusing acoustic with heavy rock and chamber music. Signs of techno-electronica that Radiohead showed on Kida are also here on 'Airbag'. 'Climbing Up The Walls' is a truly terrifying song which should not be listened to at night. ....zumindest für Freunde der Melancholie. So gefallen mir Radiohead am besten. Ein grandioses Werk. Lediglich "Fitter Happier" irritiert und stört, aber dafür hat es traurig / melancholisch angehauchte Meisterwerke wie "Exit Music". Perfekt! Back in 2009, I'd known about Radiohead for a while. I knew they had a few memorable songs that I remember seeing on TV. At this point, only Creep had made it to my playlist, and it got quite the flogging by me. Maybe it appealed to my rebellious outsider feelings, ot maybe it's just a catchy as hell song with an awesome riff that is fun to sing along to, even if I embarrass myself in the process. It was in the middle of that year, that attention was brought towards the Hottest 100 of All Time countdown. I liked to think that I was in the loop at the time, but as a music fan of merely two and a half years, I was more ignorant than I was willing to accept, (I probably still am now!) which made itself apparent when there were so many apparently popular songs I'd never thought of or could comprehend the popularity of. Back on Radiohead, they were a big talking point, having many signature songs that stood a good chance. There were "Creep" & "Karma Police" which I knew, but another I'd not heard before in "Paranoid Android". I checked it out and was immediately impressed, it just sounded like nothing I've ever heard before. As the countdown progressed, I listened to the song more and more, and grew in anticipation of its final position. My favourite point was when I realised that it had outranked "Creep", which I actually voted for regrettably! After it all boiled down, I started to listen to Radiohead more, growing to discover many songs that I had known but not by a name (seriously, how was "Just" not the smash hit that I thought it was?). Having read around, I was given the impression that the parent album to many of the songs I liked, was considered a really, really big deal. That album was of course, OK Computer. For whatever reason, I always thought that albums as critically acclaimed as OKC were ones that were of structural consistency, and the idea of hearing a bunch more songs like "Paranoid Android" was very appealing to me. On a whim (double checking the spelling for that just gave me 'on a whim okc' as autocomplete, coincidence indeed) I checked out the full album. The tracks didn't immediately gel with me, but I found the album exceptionally good to keep something on in the background while studying. Regardless of this, the album was on the backburner mostly as I pretty much listened to nothing but Muse at this time. However I remember casually watching Australian Idol one night, and wasn't really paying attention, until I heard something familiar. It was "Exit Music (For a Film)". Though abridged for obvious reasons, I thought it was a very solid and enjoyable rendition. But it also occured to me that I had this song lying around and hadn't really listened to it much. Re-listening to it then, it was brilliant. While it starts slow, the combination of the minimal instrumentation and Thom's brittle vocals worked wonders, and of course my favourite part is when it explodes to a big finish at the end. While this is a cliche musical occurance, in this case it's done without bombast, and the reverb production on the drumming is perfect. This is what edges it ahead of the similarly structured "There There" for me. The important thing about this, is that it's what got me back onto the album. While a lot of albums always have the individual tracks that I like the most, and the few weaker ones that don't stand out or get played, this album has very few of them. While I do have my few easy standouts, every track is just a joy to listen to. Going back on my pre-disposition of a cohesive album, I find that this album satisfies this greatly. While none of the tracks are greatly similar, there's an element of cohesion in listening from start to finish and finding each track fitting well next to the previous one and not being jarring to listen to. The same can be said to an extent about this album's place in Radiohead's discography. As was the case for many '90s bands who continued into the '00s, Radiohead's '90s material is distinctively more rock oriented than the albums that followed. The Bends is an exceptional rock album, but compared to OK Computer, just feels more like a bunch of songs put together than an album, as OK Computer has all the properties that make The Bends what it is, such as the excellent guitar solos, but shows hints of where the band would further venture with Kid A with the occasionally experimental exploration with the music. It's easy to forget that much of what takes centre stage is just guitar and drums. This album is wonderful. While I don't know if it's my all time favourite album, it's certainly up there. In any case, it's certainly the high point of Radiohead's career and deserves all the acclaim it gets. A delight from start to finish, more people need to hear this album. There, I wrote a stupidly long review that took nearly as long to write as the album took to listen to, spending half of it talking about semi-relevant stories of my personal life, and the other half losing it over how amazing Radiohead are, now I know what it's like to be a Pitchfork writer. I swear I'm not pretentious, I just love music. Truly as good as any album will ever get. Wunderbares Konzeptalbum, das erste richtig große Ding von Radiohead! ich kann nicht glauben, dass "ok computer"'s in den schweizer charts damals nicht höher als nummer 40 gestiegen ist! shocking! Cool album, another awesome Radiohead album! 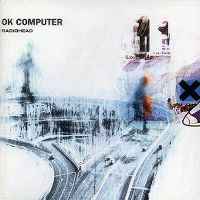 Essentially 'OK Computer' is a grand achievement for the band. 'Paranoid Android' and 'Karma Police' stand out but it's hard to pick out a lowlight. Eén van de beste albums ooit met o.a. Paranoid Android en het pareltje No Surprises. Het album wat Radiohead definitief aan de muziektop vestigde. Het is dan ook het beste wat Radiohead heeft gemaakt. Tilt rock naar een hoger plan, de experimenteerdrift van de band valt goed op zijn plaats. Thom Yorke is een uitstekend componist. Alleine schon wegen "Exit Music" die 6. Ansonsten wurde schon alles gesagt. Es tut mir leid, aber ich verstehe das Konzept Radiohead nicht. Dieses Album habe ich mir mehrfach angehört nebenbei oder auch richtig fokussiert. Ich halte es für überbewertet. Dito, ich werde mit Thom Yorkes Stimme nicht warm. Zudem gibt es mir zu viele dieser larmoyanten Balladen. Das Album wird im Buch "Hall of Shame" von Jim Derogatis und Carmél Carrillo kritisch beschrieben. Das beste Album von Radiohead! Radiohead auf Ihrem Höhepunkt, bevor sie das Herz vergassen. Riesiges Album voller Perlen. Wird nie langweilig! Ich bin kein Fan von Rockmusik, muss aber anerkennen, dass das Album legendär ist. A thoroughly enjoyable listen for the most part and very much deserves it's critical acclaim and legacy. Unfortunately I don't love it quite as much as everyone else here as I did find a few tracks slightly boring but even these tracks were at least slightly above average and I still enjoyed them to some extent. Having not listened to much experimental type music before and therefore not being fully accustomed to it yet, I wasn't expecting to enjoy this album much so am quite impressed I like it as much as I do. Overall, this album gets a 4.625/6 from me based on the calculated average rating of the tracks individually.